Why to Choose Magento 2 Platform to Build your eCommerce Store? What makes your shoppers loyal to you is your entire product collection but above that lays your ecommerce store. Yes! To let your shopper visit you, your e-store is what matters a lot and for getting the top ecommerce store, its platform is the keyaspect which if not chosen wisely, can limit the future growth and success of your online store. With a bundle of options available in the market like Shopify, Magento, Woo Commerce, Big Commerce and others, choosing out the best one for your business is the biggest dilemma faced. While each and every platform has its pros and cons, this article will help you out with why you should opt for Magento 2 for developing your ecommerce store. Magento was built as the most flexible platform. The sole reason being it’s offering of pre-made extensions.The platform has high level of usability and customization compared to other e-commerce platforms. According to Magento, 250,000+ merchantsacross the world choose Magento as their e-commerce platform. According to Builtwith comparison among popular e-commerce platforms, Across the internet,Magento powers 28% of websitesin which 16% are among the top 1 million sites. Not only this, the platform is well known for its frequent upgrading as per the users’ needs. 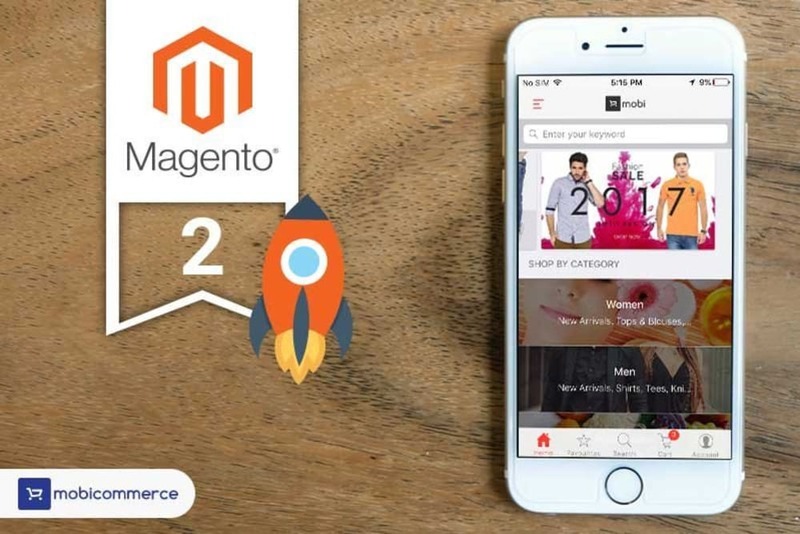 Recently, the team has upgraded its platform- Magento 2.In addition to eliminating some minor issues from the previous Magento version, Magento 2 comes with a power pack loaded with features to make it the best platform for an eCommerce website. The statistics by Builtwithfor Magento 2 usage depicts a sharp increase among the Top 1 million sites and also states that there are more than 10,000 live websites globally using Magento 2. Apart from the above stats, Magento 2 continues to win over many businesses that recognise its usability and powerful features with more than11000 Magento 2 stores switching from WooCommerce. 1) Agile &Open Source : First & foremost, Magento 2 being an open source platform makes the eCommerce development simplified. It makes you access ofvariety of templates to choose from with proper extensions & modules with widgets. 2) Speed : Magento 2 is equipped with Varnish caching which improves page loading speed making it50% speedier as compared to Magento 1.Thus, websites built with Magento 2 loads at a lightning speed. 3) Flexibility : Magento 2,comes up with unparalleled flexibility. Each & every aspect of an ecommerce store can be altered be it appearance or functionality. 4) *Scalability * : As tested on around 12 server configurations, Magento 2 has 150% more Pageviews per hour than Magento 1 i.e. it can handle 2.1 million more page views per hour and has 117% more orders processing per hour than Magento 1. 5) Rapid Development & Enhancements : Magento having over 5000 add-on extensions as well as open source fastens the development process and is a very user-friendly tool that can help you for enhancements in your online store. 6) Personalization : Magento 2 giving you the advanced functionality of tracking your shopper’s behaviour, their preferences & previous purchases, you can study them well and offer them highly personalized shopping experiences. 7) Go Global ** : Magento 2 helps in serving different regions around the world by providing the functionality like **Multi- Lingual & Multi- Currency. 8) SEO Friendly : To make your e-store visible to your set of audience, SEO is one of the most important things to consider. Magento 2 comes with the in-built features that can optimize your SEO easily. 9) Fully Responsive : Providing you a cross-platform compatibility with cross-browser compatibility for your ecommerce website, Magento 2platform rules the market. 10) Fully Customizable : Allowing to make any sort of customization makes Magento 2 best for almost all industries right from fashion to pharmacy to restaurant to furniture. Everything in Magento 2 can be altered to suit your ecommerce needs. 11) Smooth Checkout: With Magento 2,the checkout process is 38% faster compared to Magento 1. It has almost cut down the shopping cart abandonment rate to a greater extent leading to higher conversion rate. 12) Security : With secure access to multiple levels of user permissions and even more advanced level of security while transactions, Magento 2 keep your ecommerce website much safe as compared to others. The crux is that, In this competitive world where the businesses are racing, Magento 2 will not only help you out in staying in the race but will for sure help you out in leading it.